Hello. We currently have a 2008 Taurus X AWD with 130K on it. My wife and daughter compete to drive it. We are looking for a similar car for my wife to drive. Located in South Dakota, so winter driving is about half of the year. AWD is necessary, so is 6-7 passenger seating. She likes the subaru-style wagon body (taurus x, subarus, volvos, etc). I like a reliable car which has lower liklihood of major mechanical issues. I also like cars that don't rust or don't show rust (plastic body cladding) given we are talking about an up to 10 year old car in an area with road salt. With a need for 6+ seats and $10K to spend you options are going to be fairly limited. I suspect you will get several responses here for some US made SUVs. So I'll skip those and suggest a couple of nice outliers for you to consider. Because these are off most people's "must have list" they are likely to be reasonably priced. It's not that they are bad cars, they just didn't do as well in the highly competitive market place -- similar to your Tarus X. Since you seem to be quite happy with your Tarus X (rare indeed!) and it appears to be a relatively reliable model, I'd defintely look for another. Would help to eliminate family fights over who drives the other one! Or you might consider another Ford wagon, the Flex. It has lots of room, got pretty good reviews & has a fairly unique look that that I find pretty refreshing for a 3 row car. Accortd to Consumer's report it performs quite well and owner's are pretty satisfied despite not being as reliable as the Tarus. 2013 & later models have improved reliablity. Lots of luck, love to hear what you decide! I guess we might need to bump the max price to about 15,000-ish as I look at the vehicle prices. Looks like we could pick up a Taurus x for <10,000 pretty easy, but not most of the more popular models. I hadn't even heard of the subaru tribeca! Although looking at it, I wonder if the 3rd row won't quite be big enough. We have 4 kids ages 10-17, so 3rd row space is important. 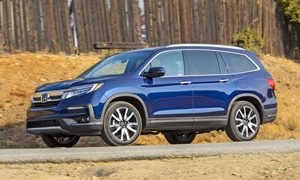 I asked my wife if she wants to drive a suburban (we have a 2001 Suburban now) and she'd prefer not to drive it as a daily driver.Maybe a Honda Pilot? They look to have a bit more room than the Taurus X, and nicer features interior-wise, but quite a bit more money as well. 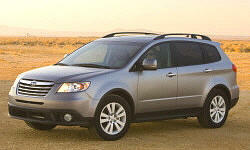 The Subaru Tribeca's 3rd row was almost unusable so I've heard, so your kids will not fit at all. I think the styling of the Tribeca still holds up today, which applies to a lot of Subarus. I don't think it would be a good option. 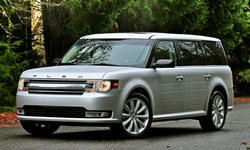 The Ford Flex is a great choice, however reliability keeps me from recommending it. The reliability scores are all over the place, but 2012 is the most reilable year. The Honda, Toyota, or 2013+ Traverse would be more reliable. The interior is almost as flexible as a minivan, so I'd consider it. 2013 and newer had a problem with the "door ajar" false alarms like many other Fords from the time. I think the Honda Pilot is an obviously good choice. The Toyota Highlander is the other one. Both are super reliable. The Highlander is the most reliable unibody SUV/wagon you will come across and is comfortable and quiet. The Pilot will have a significantly larger 3rd row I think. The 2003-2005 Pilots had the notoriously bad early 2000s Honda transmissions that would fail. 2006 and newer ones were the most reliable. Road noise will be more prevalent with the Honda than the other options you'll consider. Just get one from 2006-2008 that has already had the timing belt replaced. The Lambda SUVs (Traverse, Acadia, etc.) were not reliable from 2007 (since they were first made) to 2012. 2013s were refreshed with a few tweaks that made it so much more reliable. 2013s and newer would be a decent option if you can't find a Pilot or Highlander in your budget with lowish miles. The Outlook was not ever reliable because Saturn didn't last that long. NormT, another member, will be here to comment and bash the Japanese brands and rave about GM products. Strongly biased. The CX-9 has a decent 3rd row. Pretty reliable from 2008 and newer, not 2007. Wouldn't be my first choice. Not sure if this car was affected by the rust problems Mazda has faced long ago. Toyota Sequoia also comes to mind. It is big and inefficient, but super reliable and comfy. You'll get to 300k miles probably with this one. The 3rd row is very big. Prices will be high because it is a Toyota and reliability is top-notch. I just don't see how you can fit kids in the backseat of some unibody SUV like a Pilot or Traverse for more than 5 miles. I rented a 2015 Chevy Traverse and my kids could barely sit in the 3rd row if there were people in the 2nd row and they were 4'9 and 5'5 at the time. And this is one of the most roomy unibody SUVs in the segment. It shows how incompetent unibody SUVs are compared to minivans when hauling a family. Since they would be in such a small area in the 3rd row, they would be crushed in a rear-end collision. If I were you, I'd get a Toyota Sienna AWD and your family will be safe and comfortable. Minivans are more practical because they hold more cargo, provide more passenger space (usable 3rd rows), get better MPGs, are safer, and have big sliding doors. Unibody SUVs are just impractical minivans underneath the exterior design. Also, why the need for two huge family haulers (you mentioned having a 2001 Suburban)? Having one minivan and one efficient commuter car worked well for us for 14 years. Skip to the bottom for the most reliable offering if you can deal with the third row in the older models. We tried a Subaru Tribeca in 2010 (there was only one design) and with the slightly stretched Outback platform, it never worked for anything other than kids under 10 years old. So that is definately not a possiblity. The new Subaru Accent is a true three row vehicle, but is way out of your price range. So Subaru is out as the Outback mentioned only seats 5 in two rows in a squeeze. While Lectrofuel is correct about the Toyota Sequoia you are again going to be hard pressed to stay in your price range. A 2006 with 108,000 goes for about $11,000 near me. However, like he said, with good maintenance Toyotas are still the best in reliablity although the margin with other manufactuers has shunk as of late and they have had a few cars that have issues in redesign years (not this one however). However, the 2006 model year had tranmission problems. After 2007 (2008 on) that problem went away. So that car I mention - it might be being sold for that amount because it has the chronic transmission problems of that year. I have not had the problems of fitting people in the third row of a 2010 Buick Enclave I owned for 6 years and nearly 80,000 miles with no problems (when I could not make Subaru work for me). My dad is 6 feet tall and fit back in the third row for nearly three hours driving to and from Mt. Washington which I climbed in the car with 6 people (my mom was back there as well but she is shorter). He in fact commented that he was surprised how comfortable it was. I agree Norm is biased towards GM, but others are biased against it. I am neutral on it as some of their cars are good as they leverage Kaizen process improvement (six sigma) just like Toyota now, but sometimes their execution is suspect. My thoughts on GM? The Enclave is the best of the bunch in reliablity but they don't last as long as the above Toyota and you would be probably happy to get 120,000 to 150,000 on one of the Lambda triplets before problems set in. Right now according to Consumer Reports 2013 on is fairly reliable for the Buick Enclave. For 2013, 2014, and 2015 the one trouble spot is the climate system, tha that is it. On average the 2013 would have 72,000 miles so I would bet you could get another 50,000 on that car. The GMC Arcadia is an interesting car. My brother owns one he bought used for $20,000 a few years ago, and now it is six year old (a 2012). He had one problem in the initial warranty period, the side-view sensor system failed twice. When he switched dealers they fixed it four years ago and it has worked fine ever since. That has more to do with the dealer service quality than anything else. I had to convince him that GM's quality had improved to get him to buy it (he only bought Toyota before this) but he is happy with the car now that the one issue is fixed. He has 110,000 on it now and he is still happy. The only caveat I have about this brand from GM is for some reason, Consumer Reports users don't like this car - 2012 is reliable but 2012-2014 has climiate control issues (it breaks a lot) and some have suspension issues (just a few). So quality is more spotty on the GMC than the Enclave (showing the difference between divisions). I know some on this board love Mazda and they are pretty good cars. In the case of the CX-9 you are looking at unfortunately for you, is not the most reliable of their offerings. It was redesigned in 2016 has some engine issues (water pump in particular more often than not), paint and trim issues, and in car electronic failures. The two years previous to it (2014-2015) before the redesign were better. Paint and trim and rattles are concerns, and there were a few drivetrain concerns (rough shifting) but in those years you are far more likely to be happy. I would not go any older and the years previous to that (2011-2013) there were an assortment of issues I would avoid (both the engine and drive system are suspect those years). I get my reliablity information from Consumer Reports again here. Honda Pilot - 2009-2012 have transmission issues but they fixed it in 2013 through 2016. Redesign in 2017 the transmission started to have problems again but not as bad as the earlier design. Paint and trim (some rust) and in car electronicis issues are on the redesigned 2016. If you like this one and don't find any rust with a close check, they are good cars these days. The car probably best for your case that is very reliable if the third row is big enough on the older models is the Toyota Highlander. It is above average in reliablity all the way back to 2001 in Consumer Reports survey. When they get that old they do have engine and transmission issues (the cars are just too old) but they are above average compared to everything else. For truly reliable Highlanders you can start with 2004 as the issues are relatiively minor from that point on. Out of all the cars mentioned, if the third row works, it is your best bet for reliable AWD without rust to replace theTaurus X AWD. All models of Traverse and Enclave will accommodate my 6-foot, 34" inseam frame in the 3rd as they are the biggest crossover you can buy today and in the past. Don't listen to Lectrofuel as it sounds like he has not ridden in the 3rd row of one. They also provide the largest cargo capacity after the 3rd row of all crossovers. These are very large and long vehicles so make sure they'll fit in your garage if you plan on parking in one. Most of the other crossovers only accommodate preteen kids comfortably so it is better to size up your needs of of a growing family and how many years you'll need to accommodate them. Thanks! That's a lot of good info, since I don't know much about these cars, especially the import models (I've only owned domestics, about 25 years of car ownership). We need to go to the dealers wtih kids in tow, to see how the 3rd rows compare. I'm 5'9" and while I could fit in the 3rd row of the Traverse, my knees were in my chest and the 2nd row was pushed forward so that the 2nd row passengers were also cramped. I rode for 15 minutes in the back of one and wouldn't really want to again. Honestly, the only thing I liked about it was the quiet cabin, smooth ride, remote start, power trunk, and the exterior styling was decent and inoffensive. Everything else felt like it was from 2010, probably because that was around the time it was designed. Felt more ponderous than a minivan and got 16 MPG. This is still probably the best option for you aside from the Flex, Sequoia, and Sienna. When I think about it, an old Sequoia would have the same drawbacks as the Traverse since it was designed in 2000, but even more severely. You would only gain reliability and 3rd row space with the Sequoia, but lose some of the unibody Traverse's ride comfort. The Domestics are not catching up to the Japanese brands when you are comparing anything older than 2015. They simply were not as reliable and you can easily see this just in how old Japanese cars hold their value better. New Domestic cars are catching up to the Japanese brands and are getting closer. You'll probably go without a major repair on the Sequoia until over 250k miles and only until 150k miles on the Traverse. Sequoias will have higher mileage than a comparably priced Traverse, but the Sequoia will outlast the Traverse. You'll be able to sell the Sequoia for close to the same price as you bought it for and you can't say that about the Traverse. There are some things to think about. What is your zip code? We can find you some good cars for under $15k. 57401. Thanks for digging into this for me. I can see your point about Toyotas and Hondas holding their value - I had no idea really, until looking into this. For a given price, the import versions start higher priced, but appear to hold their value better than a comparable domestic, resulting in a lower ownership cost due to depreciation alone (let alone major repairs). 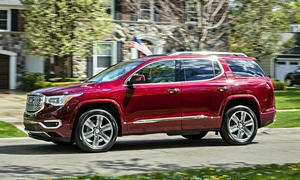 The Traverse was rated higher than Sequoia until 2018 redesign by Consumer Reports. CR alway lowers the score of a new, redesigned vehicles. Though I don't think they are in the same ballpark as far as a driving simce one is older body on frame for Toyota and other a modern unibody, they score closely as a crossover. The new 2018 Traverse 3.6l gets 25% better highway fuel economy than Sequoia. Here is CR break down for a new one. Yeah, the Sequoia does compete with a Tahoe and not a unibody Traverse, but mikesdak could consider either because the body on frame provides a lot more space in the third row. The downside is you'll still give up the unibody crossover's MPGs and smooth ride. CR doesn't automatically lower the score of a car because it is all-new. There are plenty of examples of this. There isn't really a lot of selection where you live. There are many 2007-2010 Yukon XLs and Suburbans under $15k, but it sounds like you don't want another trucky SUV. These links are sorted from what I think are the best to least-good deals. 2011 Toyota Sienna LE- You could get another 150k miles out of this minivan. At $12k, this is a steal. It is an LE, so the interior is more basic than most cars on this list. However, if you want a lot more cargo space than the other SUVs and a larger 2nd and 3rd row, this would work best. It says the CarFax is clean, but they don't provide it so you should ask for it. This is the only car on the list without AWD, so that is probably a deal breaker. That is probably why it's so cheap. 2010 Honda Pilot 4WD EX-L w/ Rear Entertainment System- This is a good price at $15k. Better equipped than most on the list and it has leather and a DVD screen in the back. Has 4WD. It is more utilitarian than any car on the list except the Sienna, so the interior will hold up. The interior has tons of space and places to store things. The combined passenger space is actually 3 cubic feet more than the Traverse. The third row is comparable in size and in some dimensions is larger. Probably 120k miles until something breaks. The seats in this car are notably more comfortable than any of the SUVs on this list. Honda makes supportive seats. I know several people including my sister that has this generation Pilot and they all love the car. Has heated seats. 2013 Chevrolet Traverse AWD LT- I think this is a better deal than the Buick because they are exactly the same car and this one has less miles and is a grand cheaper. Both have leather and I like the style of Chevy more than Buick both in and out. This car probably has 75k miles until something will go wrong. The Honda and Toyota will have higher resale values. Has heated seats, sunroof, and backup camera. 2014 Buick Enclave AWD Leather- This is the only one over $15k. Probably 60k miles until something will go wrong. Has the same attributes as the Traverse. I don't know if "brand prestige" exists with a Buick Enclave, but that is an opinion. You get a Buick badge. Has heated seats. 2009 Toyota Highlander 4WD- I threw this one in here because it is reliable. I'd say 150k miles until something breaks. The drawback is that the 3rd row is much smaller than the other choices. Has a good AWD system with a snow mode (the others probably have this, too). It rides and is quiet like a Lexus, but the interior is almost as basic as the Sienna. Thanks! I think we'll give the pilot a drive. I did find a gold 2011 model which might be better for us (gravel roads) rather than the maroon, but who knows. What is the deal with "snow mode"? I read about snow mode on another site. Seems like a good option. Snow mode on Toyotas sets the transmission to start from a stop in second gear instead of first to numb throttle response. It just makes it easier to drive in the snow and not lose traction as easily. The button functions the same in Hondas, too. I saw that gold one but didn't mention it because it was a grand over budget. The backup camera will be easier to see in the gold one because it has a much larger screen. Also, it was meticulously maintained. The last owner replaced the brakes 1,000 miles ago, so that is one less thing to pay for. The downside is you'll need to replace the timing belt soon at every 100,000 miles. That is an $800-$1100 replacement. If you are willing to pay a little more, this is a better car than the maroon Pilot I linked because both previous owners took good care of this gold one..
Don't get an ex-rental car! Hundreds of people have driven them and since renters don't own them they get trashed. Thisis an extreme example and 99% of people probably don't do this, but renters can do anything to the car and the rental company may not notice it. 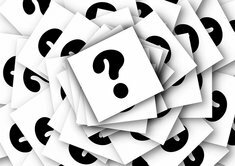 Wear and tear on the powertrain is only sometimes noticeable and rental companies probably do not care about fixing or replacing it before selling to the next owner. I don't think there would be many rental cars around the OP's area (there wasn't when I checked), so they don't have to worry about it much. "The Lambda vehicles have as much space as a minivan without the stigma of driving a van." A 2011-2018 Toyota Sienna has 16 cubic feet (that's 120 gallons) more behind the third row than the Traverse, 17 more behind the second row, and 34 cubic feet (254 gallons!) more behind the first row. Sienna has 3 more inches of leg room, 2 inches more hip room, 1 inch more of headroom, and 4 inches more shoulder room in the 3rd row. The 2nd row is significantly larger in every dimension in the Sienna. The 1st row dimensions are the same. 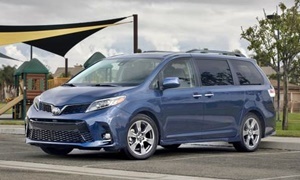 Exterior-wise, the Sienna is 3 inches shorter than the Traverse despite being significantly smaller on the inside and the Sienna is 1 inch taller. The Traverse only has .7 inch more of ground clearance. mkx-models, you may have been mistaken, but why did you say the Lambda vehicles have as much space as a minivan when you own a Lambda vehicle yourself? Though the Lambdas may list large passenger and cargo capacity, one ride in the back seat will show that stats like cubic feet of interior space have nothing to do with the comfort and usability of that space. The 2nd row sits so low to the floor that even with only about a 32" inseam (though I'm 6' 2") I felt like my knees were in my chest and it was not comfortable at all. Roomy? Sure, except for actual space for legs (not talking here about "legroom" which is a different, somewhat nebulous stat prone to distortion). The Totally Integrated Power Modules (TIPM) on the Durangos and almost all Chrysler products from 2008-2015 were known to fail. The TIPMis responsible for controlling and distributing power to all the vehicle's electrical functions. So when your TIPM goes haywire, bad things start happening. Things like your water pump can stop working, your engine can stall out and your airbags can randomly deploy. I would avoid against it, but the newer models don't have the problem as frequently. 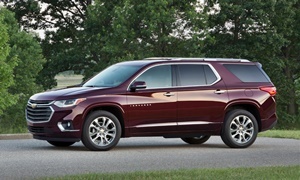 I would personally pick the Traverse over the Durango by far, but other than the TIPM problem it seems like an OK choice. The Durango is a media darling that they would buy no one shopping does. Sort of like Mazda. Marginal crash standards and dated interior and driving dynamics, along with quality concerns are enough to stay away. The Lambda while no athelte at 5,000 lbs drives small like a car. I've sat in all of the seats and much prefer sitting in any seat in a Acadia than sitting in the tinny sounding and rough riding without sear bottom cushioning of the rear seat of the inlaws 2012 Camry. The Lambda(Traverse)also rank much higher than does the Durango in Consumer Reports. So many people have been burned badly by Lambdas that I hesitate to recommend them. The 2013 update helped a little, but they're still iffy. Other things I don't like about the Lambdas: as others have noted, the rear seats are mounted very low to the floor, plus there's no deep well in the cargo area like you'll find in Fords. For cargo space behind the third row the Fords are best, even though the official cargo volume specs don't entirely reflect this. The second-gen Lambdas have better seating and a removable floor in the cargo area, and will likely be more reliable, addressing all issues. But they're so new they'll be expensive. I personally have a 2008 Taurus X, but with about 108,000 miles. My concern with these is they are getting up in age. Many parts on cars are designed to last at least ten years. Might sell ours now that two of three kids are in college. Or not, as we've got to get them and their stuff to / from college. The Flex and Explorer are related models. I don't care for their proportions as much (they're each bulkier than the Taurus X), but it is possible to find one with less age / miles. 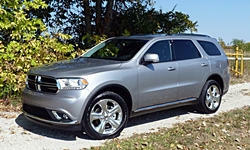 The Durango has good seating and drives nicely, but is much truckier and less fuel efficient. Also not much cargo capacity behind the third row. The Mazda CX-9 and Toyota Highlander have passenger and cargo space issues, but if you don't need more space than they offer are good choices. The Honda Pilot has a little more passenger space, but like the other two lacks the deep well of the Fords. NormT - you (or more likely your parents) must work for GM. The fact that you went from zero posts to the all-time post leader here in the space of about 8 months says quite a bit about you and your situation. It's the same on other forums (fora?) too - constant GM-shilling, with a "na-na-na-na I can't HEAR you!!" attitude towards every comment(er) that doesn't support your GM-centric world view. Sad. Also, WTH does a 2012 Camry have to do with this discussion??? ZCD, we spend $10,000-15,000 annually on our vehicles. With the large expenditure next our living quarters, we have to make sure we are consistently getting out money's worth and the GMC/Buick/Cadillac/Chevrolet is where we gain the most bang-for-buck for our investment. We are not riding around in a penalty box like some of the vehicles that you and others have offered. You wont see me offer economy car advice unless you are suggesting someone pay $25K for a front wheel drive tin box the owner wont be happy with when there are better choices with longer warranties. zcd1 and I have the exact same opinion. He bashes every other car brand (especially Toyota) at whatever chance he gets (like failing a moose avoidance test LOL). I noticed he suggests Buicks more than the other GM brands, but never knew that he had the notion that every car that isn't a luxury car is a "penalty box." That is non-sense. I don't consider any economy car I have driven to be a penalty box. Buick isn't a bad brand, but their cars are not some sort of magical wonderland of innovation like he seems to describe. Neither are the other cars we mention some of the time, but many people don't like domestic brands. It isn't like one brand (GM) is so much better than EVERY other automaker. If you only think one brand is the brand everybody should buy, all Japanese cars are bad, and economy mainstream cars are stupid purchases, I question your usefulness on this site. I've never heard ANY car enthusiast (or anyone) say that. If you spend $10,000 to $15,000 on your cars annually, I recommend keeping your cars until they fall apart to get your money's worth. 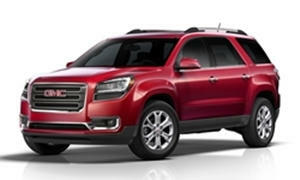 The GMC Adadia you seem to love so much is ranked #13 out of 17 "Luxury Mid-Sized SUVs" by Consumer Reports, with abysmal predicted reliability (1 out of 5 stars) and a middling owner-satisfaction rating of 3 out of 5. Its overall score was 57 out of a possible 100 points. The class leader scored 90 points. The Acadia is not a good choice overall. Even Mr. Karesh, owner of this site agrees. Oh, and the Durango you bashed? 65 points out of 100, with better predicted reliability and 4 out of 5 owner satisfaction. The 2017+ Acadia is a totally different, smaller vehicle. The new Traverse and Enclave are stretched versions close in size to the old Acadia. If ever been inside the Lambda's, never been in the Traverse, they are very much the same with different trim levels offering small changes. 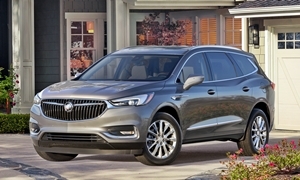 But the sheet metal being the biggest difference and a 4-year, 50,000 mile warranty for the Buick and probably the better deal used CPO(certified preowned). My wife didn't like the extra chrome interior trim and the brown Tuscany version we drove. It was the quietest in the 2nd row out of most we drove. The 2018 Acadia 2.5l rode like an on old farm truck from the 2nd row as we pulled out of the dealership parking lot with allot of tire noise. Though the Denali is a very good deal at low $40's discounted, we didn't drive it at the time. But when you factor in size, price, and warranty Buick is hard to beat.